Dustin Brown recorded a hat trick, Anze Kopitar scored the go-ahead goal early in the third period and had two assists and the Kings defeated the Oilers 5-2. Big games from Dustin Brown and Anze Kopitar have been infrequent for the Los Angeles Kings this season. On Sunday, the franchise's cornerstone players delivered against the Edmonton Oilers. Hockey Night in Canada podcast: Why are goalies so weird? "Sometimes it just comes down to players feeling good on certain nights, and I think me and [Kopitar] and [Alex Iafallo] all felt really well going into the game," Brown said. Matt Luff also scored and Cal Petersen made 32 saves for the Kings, who snapped a five-game home losing streak. Alex Chiasson scored twice for the Oilers, who went 1-1-1 during their first road trip under new coach Ken Hitchcock. Connor McDavid had an assist to extend his point streak to six games, and Cam Talbot made 27 saves. Kopitar put the Kings in front 4:27 into the third period when Derek Forbort sprung the Kings' captain for a breakaway with a long pass into the neutral zone. Kopitar used a wrist shot through Talbot's legs for his third goal in the last five games. Brown completed his hat trick at 19:06 with an empty-net goal. 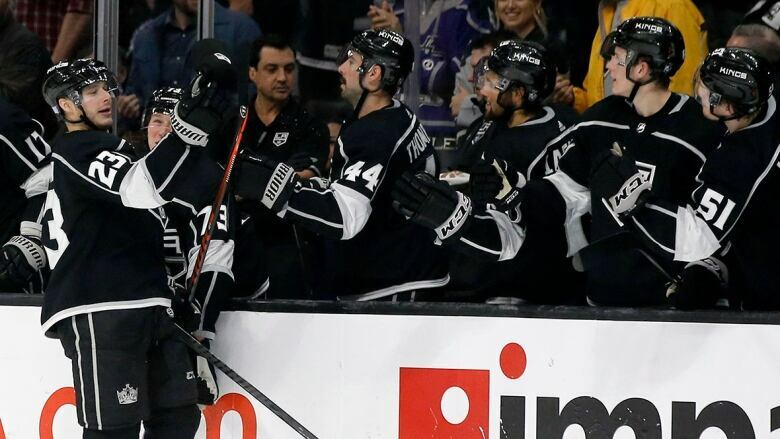 Brown's fifth career hat trick was the second multi-goal game by a Kings player this season. Kings coach Willie Desjardins said the top line of Kopitar, Brown and Iafallo has been feeling the pressure as scoring chances had dried up. But that group was vital as the Kings scored more than three goals for the first time since a 4-1 win over Anaheim on Nov. 6, in Desjardin's first game in charge. "They have worked hard and it's nice to kind of get the monkey off your back where you're finally scoring a little bit, so it was good to see them get [four]," Desjardins said. Luff added an empty-netter at 19:33 to extend his scoring streak to four games. He is the fifth Kings rookie to have a scoring streak of at least four games and the first to do it since Jimmy Carson had a goal in seven straight from March 19-30, 1987. Brown scored on the power play to tie the game at 2-all 4:13 into the second period after Chiasson put Edmonton in front at 2:16. Chiasson tied it at 1-1 at 13:19 into the first period with his ninth goal of the season. McDavid picked up his 10th point and seventh assist during his point streak. Chiasson has four goals in his past five games. Hitchcock said he would consider giving Chiasson a chance to play with McDavid on the top line after seeing them connect on Chiasson's second power-play goal. "He doesn't have great foot speed, but he's got great offensive instincts and where he's really good is down low," Hitchcock said. "He gets himself into great spots. I think we got to consider bouncing him up one notch." Brown gave the Kings a 1-0 lead at 7:56, tapping in a pass from Kopitar at the back post after they got in behind three Oilers. It was Brown's first goal since Nov. 3 and ended a stretch of eight games without scoring. Hitchcock viewed his first week with the Oilers as a success and expects the team to make significant strides moving forward. "I'm really excited by the potential," Hitchcock said. "I know we can get better and I know that it's there, but I also know we came in three tough buildings. All their best players, they all got rings, and they were the best players tonight. And we still went at those guys pretty hard, so that's a good sign." Notes: Kings F Carl Hagelin was placed on injured reserve after sustaining a sprained MCL in his knee against Vancouver on Saturday. Hagelin will have an MRI on Monday. ... Kings G Jonathan Quick is expected to return during the team's upcoming three-game Canadian road trip, coach Willie Desjardins said. Quick has not played since sustaining a knee injury in practice on Oct. 27 that required surgery. Oilers: Host the Dallas Stars on Tuesday. Kings: Visit the Canucks on Tuesday.